FIVE of our cheeses won medals at the 2018 NZ Champions of Cheese and Thorvald was also awarded THREE trophys. 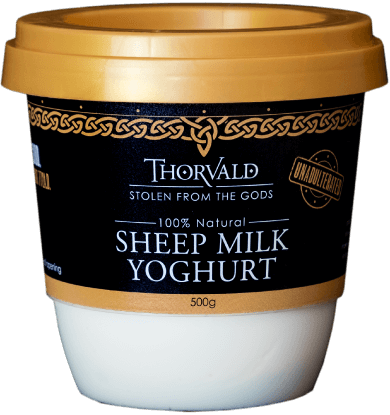 LEGENDARY SINCE ABOUT 772 A.D.
Based in Nelson, New Zealand, Thorvald produces premium cheeses and yoghurt made from 100% New Zealand Sheep Milk. We reckon our sheep produce the finest milk in the world and that's what makes our yoghurt so good. Fit for the Gods... and you! Our 100% Natural Sheep Milk Yoghurt is now available around the country. Valued Customers – Unfortunately due to the ongoing effects of drought in the Nelson Region, we were forced to dry off our ewes at the end of February, much earlier than usual. Naturally, this has resulted in our range of yoghurts and cheese becoming increasingly difficult to buy and in some instances such as plain yoghurt and sheep milk Camembert, have run out altogether. We apologise for the inconvenience this may cause but, as it should be, nature is in charge. The good news is Thorvald will be back in production this coming August.